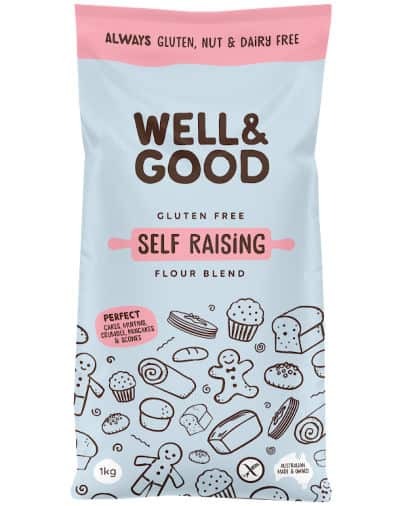 The Well and Good gluten free wholesome flour can be used in your favourite recipes to create a healthier version of the original. We’ve included brown rice flour, rice bran and flaxseed flour to increase the fiber and protein content. This flour is perfect for sweet or savory dishes and substitutes well for our existing plain flour. What you’ll receive: 5x 400g boxes of flour. Brown Rice flour, Tapioca Starch, Potato Starch, Rice Bran, Flaxseed Flour, Modified Tapioca Starch (non-GMO), Dextrose Monohydrate, Thickeners (Sodium Carboxymethyl Cellulose, Hydroxypropyl Methyl Cellulose, Xanthan Gum), Vegetable Emulsifier (Mono and Diglycerides of Fatty Acids). This flour blend is a low FODMAP, tummy friendly product.